No one knows the horrors of illicit backyard slaughter farming in Southern Florida like Richard “Kudo” Couto, founder of the Animal Recovery Mission (ARM) in South Florida. In the last couple of years, he has been instrumental in shutting down 90 illegal slaughter farms. He estimates that there are about 150 still in operation in Miami-Dade County alone and another 700-to-900 scattered throughout the rest of the state. 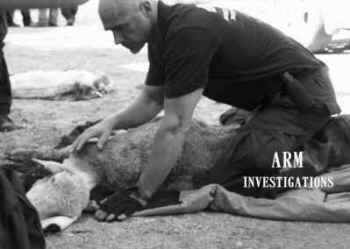 Richard Couto of ARM at the Rudy Acosta animal slaughter farm Raid in Area 97. Almost 600 animals were rescued this day and stood as the largest animal rescue of 2011 in the USA. To obtain evidence of these crimes, Cuoto became an “insider,” befriending and living with members of what he calls a mafia-like community. For a year, he collected video and photographic evidence of the most egregious forms of cruelty to animals imaginable. Video footage reveals shocking scenes, among them: children present at both the killing and the butchering of animals; defendants gutting and dragging a live, struggling pig with a meat hook; an adult and a young girl torturing a fully conscious goat by stabbing him, making holes in each of his hind legs with a knife (to hang him from meat hooks), slicing the nerves in his neck, and beating him with a meat cleaver. In most of these horror shows, it takes three to seven minutes for the suffering animal to expire. These bloodbaths are being carried out next to bustling new suburban areas outside of Tampa and Miami, where, “nice people and families” are moving in. So how does Cuoto learn about these grisly operations? Sometimes a new resident tells Cuoto what they heard and saw. But most of the tips he gets himself, from scanning Google satellite maps. He identifies the sites by the makeshift housing and debris piles containing animal carcasses and building-material that satellite footage picks up. The Animal Legal Defense Fund recently brought a case against two of these so-called backyard slaughter farms that Couto investigated, Cuesta Farm and Planchart Farm in Hillsboro County outside of Tampa. The sheriff’s office ignored his highly detailed reports on his investigations, Cuoto says, until the media and ALDF picked up the case. Couto has overseen the rescue of about 2,000 farm animals and found them permanent sanctuaries with the help of the Animus Foundation. He has plans to purchase 1,000 more acres to provide sanctuary for more animals in the near future. We will be keeping a close eye on developments in Couto’s amazing work in the months to come. In the meantime, if you would like to email an already prepared letter to your own state representative and senator asking them for legislation that bans backyard slaughter, you can visit Take Action Against Backyard Slaughter Near You.